A warm windowsill pie. Bakers recreating Grandma’s recipe from faded index cards. Pie ingredients can be simple crust and filling; a really great pie incorporates something special. For Georgia-based Pie Provisions, adding Promoted Pins on Pinterest became a special ingredient in growing their business. Gathering around pie was always a sweet celebration for Pie Provisions’ owners Lauren and Cody Bolden; Promoted Pins on Pinterest help the country pull up a chair to their pies. Never ones to dream between two pie crusts, Lauren and Cody baked up an idea to address fresh pie restrictions. From Pie Bar to the at-home Pie Provisions kits, their goal was sharing pie. Each “do it yourself” Pie Crust Mix kit includes an iconic Pie Bar glass jar of pie filling, crust mix, ingredient window and tips for making the best pie. The Pie Provisions website doesn’t stop with just ingredients; they sell essential tools like handcrafted Vermont Rolling Pins, pastry cutters, pastry blenders and pie servers. As their pie kits got regional store shelf space, the Boldens thought beyond the pie crust. A meeting with Pinterest co-founder Evan Sharp at an Atlanta Pinterest community conference served a new way to promote pies while growing the business. Lauren and Cory left with statistics and information about Promoted Pins for Pinterest as marketing options. They had a Pinterest board and social media marketing but were impressed with the hands-on, interactive Pins focused on more than just looking at or pinning an idea or recipe. Both companies wanted consumers to see something appealing and not just online. The Boldens created their first Promoted Pin and it became the pie Pin seen around the boards. Pie Provisions posted a Sweet Cream and Peach Preserve Slab Pie recipe just as Georgia peach season began. They were initially looking to capture new online customers and drive business sales. That one Pin resulted in an enormous 600% spike in website traffic. Combined with Pinterest’s analytics, tracking and creativity; the Pin helped propel Pie Provisions to a new level of customer outreach and sales. “Pinterest’s mission is to inspire you to discover and do the things you love. With Pinterest, entrepreneurs get their ideas in front of people ready to be inspired and go out and do those things in their lives.” – Arthur Sevilla, CPG vertical strategy lead at Pinterest. Pinterest’s Promoted Pins were a match made in pie heaven to help Pie Provision’s potential audience eat with their eyes first. The Bolden’s capitalized on Pinterest’s established audience and inspiration boards as a perfect combination of promotion and hands-on approach. Pie Provisions could target a site visitor searching for peach pie to be directed to a Pie Provision’s Promoted Pin. With 70 million people on Pinterest actively engaging with food and beverage content, the built-in food audience for Pie Provisions went well beyond Georgia. In the social media virtual kitchen, Pinterest takes the same hands-on, personalized approach as Pie Provisions creating a virtual atmosphere encouraging community creativity. According to third party research, Pinterest show 95% of Pinners on food and beverage boards find something new while 67% of Pinners are inspired to shop for a food product when they aren’t initially looking for one. With data in hand, Pie Provision saw a clear measure of impressions and further optimization opportunities. Pie Provisions wanted customers and potential customers to discover pie. Pinterest’s cost per customer was 60% lower than other platforms with the process more like baking a pie, than simply pushing pie ads. This was appealing to Pie Provisions as a small business. Pinners coming to Pie Provision’s board looking for pie might find products. Other times, a crust-making technique (the Bolden secret to flaky crust: cold butter cut quickly into flour plus cold water incorporated rapidly). In 2018, Pie Provisions acquired 13% of new members from Pinterest posts addressing Pinterest’s and Pie Provisions main demographic: 65% of members from the platform are female. Each Pie Provisions Crust Mix box includes a “how-to” booklet walking consumers through the process. The Pinterest Promoted Pin process became Pie Provision’s own “how-to” guide to promotional social media. The platform’s unique curation and visual features made it perfect for a company to advertise their products directly to consumers. 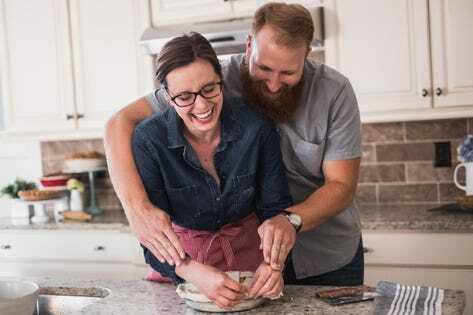 Pie Provisions and Pinterest became a second kitchen for the Boldens to explain pie crust, answer pie-baking questions and most importantly, connect with consumers. For Pie Provisions, Pinterest became an added ingredient to provide fresh-baked windowsill pie experiences to a larger audience. At the holidays, they added seasonal tastes to their pie filling line-up: bourbon pecan pie, ginger peach, Georgia blueberry and a special holiday tart cherry filling with a hint of almond. As shelf-stable products until opened, Pie Provisions provides a homemade pie filling for years to come (if consumers can wait that long.) From a simple Pin to a thriving nationwide business, Pie Provisions and Pinterest have taken a slice out of the pie business.